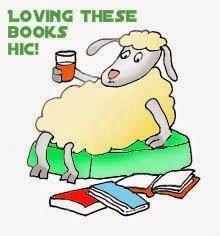 I love my little knitting blog! I design / create unique, original high quality accessories. I sell what I make on Etsy and my own web site - thefemininetouchdesigns.co.uk. Some of my creations I have written up in to knitting patterns & kits which are now published on-line. Here on my blog I share what I have learnt, business wise & crafting wise and happy to promote other crafty sellers. You will find some of my personal experiences here too. I'm getting all geared up for Christmas, knitting chunky hats for my on-line stores, ordering yarn for knitting kits and making felt Christmas decorations for my local yarn shop. I wanted to find a way that I could get you, my blog followers involved in my Christmas get readiness. I thought that starting November off with a Giveaway might get you in the mood, especially if I could incorporate a festive coloured yarn in to the gift. 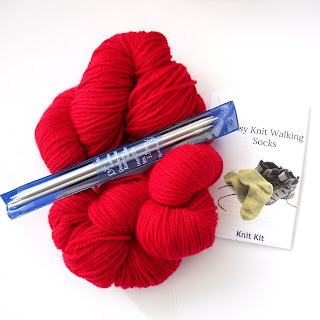 Here it is, my easy knit sock knitting kit in a festive scarlet red ! WoW! 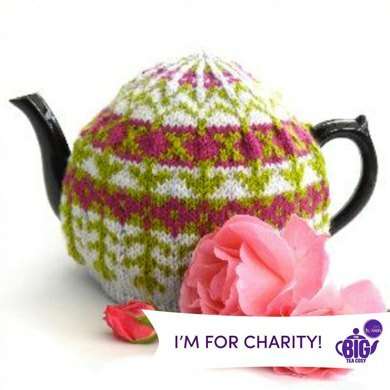 The kit is suitable for an experienced knitter, as I don't explain any of the basics, assuming that the knitter knows how to cast on and off, knit and purl, can do short row shaping and decreases. What I do explain in the instruction is how to position your work on the double pointed needles, simple sock construction, when to do the short row shaping and decreases and why and of course the finishing Kitchener stitch. 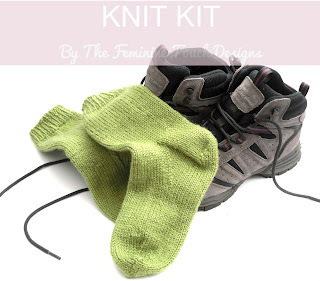 I wrote the instructions after only knitting a few pair of socks myself so I put my learning experience in to the instructions, including colour photographs along the way too. You could knit the socks ready for Christmas day, wear them yourself or gift them to a friend or family member or put them out for Father Christmas (I'm sure he would love these!). If you can't knit then wrap the kit up in Christmas wrap and put them under the tree x. Just answer the questions below for your chance to win one of these kits. The giveaway is only open for a week. Would love to win one of these sock-knitting kits! It would be the perfect way for me to knit something I've never attempted previously! Thanks so much for the chance to win! Designer, Creator and Inspiration behind these blog postings.